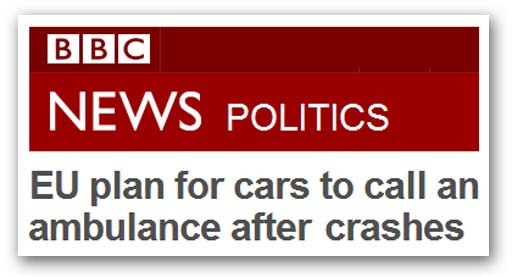 I first wrote about this in September 2005, again in September 2007 and then in August 2009 - the EU's so-called eCall system. Initially, it was supposed to be voluntary, a system technically known as "Automated Crash Notification". It relies on sensors in a car which detect an impact and other events, and automatically sends a call to the emergency services, using GPS data to determine the location of the incident. Although relatively successful as a private sector venture in the United States, where the system is marketed as OnStar, the EU wanted to turn it into a state-run European system. As such, there were no takers, not least because the system is expensive and difficult to manage on an EU level. And, for the individual, there are serious drawbacks. The system can also be easily converted to form the basis of a road charging system, and to facilitate state surveillance of private vehicle movements, remote speed control and automatic road law enforcement. Needless to say, freedom of choice on the part of member states and "European citizens" is not acceptable to the EU parliament. Despite the opposition of some Brit MPs, its Transport Committee called for compulsory adoption by 2015. That was in June and now the full parliament has backed compulsion, clearing the way for the commission to table a legislative proposal by the end of the year. Therein is demonstrated one of the very best reasons why we must get out of the EU. Such decisions should not be made by the EU, especially in such contentious areas in which private sector involvement is almost certainly better, not least in avoiding statist system creep. The key lesson, though, is that the EU never gives up. Once an idea is in the system, the "colleagues" never take no for an answer. They will keep coming back again and again and again until they get what they want. That is the way integration works, and the only way to stop it is to get out.